Lesley Birch from Glasgow, Clare Maria Wood from Whitby and Karen Stamper from Hull met in Cambridge in 2001 whilst working as teachers at The Perse School in Hills Road. They became great friends, painting and drawing together late into the night in my kitchen, listening to David Bowie and mixing words and art. Clare Maria Wood, former Head of Art at The Perse School, now concentrates on painting and printmaking inspired by walks around the Beech woods near her Cambridge home. “The Postal Project was a fun way of keeping in touch and we really bounced off each other’s visual ideas. The thing just kept going … over years,” she said. 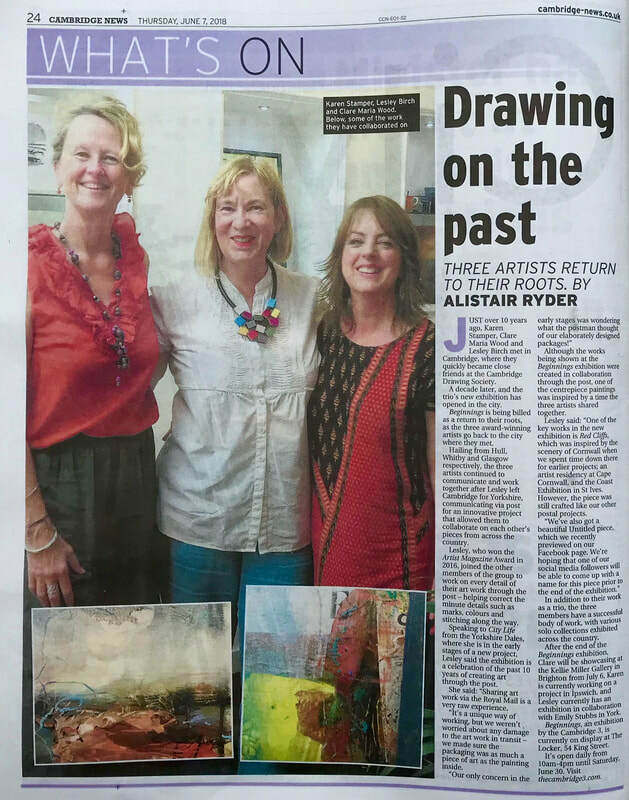 The three artists were awarded an art residency in Cape Cornwall which led to a successful exhibition in St Ives in 2017.